Supply chain management delves into business at the big-picture level. It puts all the operations together to ensure that everything functions smoothly. It’s the ideal position for individuals who are interested in managing people, organizing moving parts, and analyzing global trends. According to the Bureau of Labor and Statistics, supply chain management and operations is a fast-growing career field. The employment rate is expected to increase by 7 percent by 2026. It’s also an industry with high salary potential with additional earning opportunities due to commissions and bonuses. Earning an MBA in supply chain management opens up a host of opportunities to work as an inventory control manager, purchasing manager, vendor managed inventory coordinator, warehouse operations manager, and more. And almost every company needs quality employees in the field, which means you could find yourself working in retail, healthcare, technology, and more. If that sounds of interest to you, the key is finding the right MBA program for success. Below, we’ve outlined our top seven picks for MBA programs in supply management. The Lehigh College of Business and Economics offers a concentration in Supply Chain Management as part of its Flex MBA program. The concentration provides hands-on-experience in supply chain management from industry experts and top companies in the industry. Students must complete nine credits—three courses—to earn this concentration. Topics cover everything from demand and supply chain planning to strategic supply management and transportation and logistics management. In addition, the school is home to the Lehigh Center for Supply Chain Research, which serves as a preeminent platform for supply chain research and industry innovations. The Center regularly hosts events for students, industry partners, and faculty while also offering symposiums, benchmark studies, discussions, and publications. The full-time MBA at the UT Austin McCombs School of Business offers a concentration in Supply Chain & Operations Management. This specialization requires students to six courses in supply chain management, project management, supply chain analytics, and services operations management. These courses provide students with the analytical skills and understanding they need to be successful. McCombs is also home to the Supply Chain Management Center for Excellence, which offers students a breadth and depth of understanding in the industry. It brings together experiential learning, financial resources, industry engagement, and more. There’s also a Supply Chain Management Certificate program for Executives. There’s a concentration in Supply Chain Management at the Penn State Smeal College of Business. This concentration builds on a student’s expertise in procurement, sourcing, logistics management, and conversion. Top faculty in supply chain management includes Robert Novack, co-author of Transportation and Creating Logistics Value: Themes for the Future, teach the courses. And students go on to work for such top companies as Amazon, Apple, DuPont, ExxonMobil, Facebook, and Johnson & Johnson. Smeal College is also home to the Supply Chain and Information Systems department, which is consistently ranked as the #1 leader in supply chain education by Gartner, Inc. 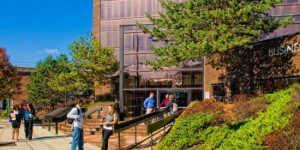 The Rutgers Business School is home to a full-time MBA concentration in Supply Chain Management. Students who choose this path are 100 percent employed three months after graduation thanks to the fact that they graduated from the 11th ranked school according to the U.S. News & World Report. The concentration prepares students to handle everything from logistics to supply chain management, procurement, sourcing, and more. Best yet, students can choose from over 40 supply chain management courses to complete their degree. In addition, Rutgers offers the Center for Supply Chain Management for educational and research opportunities. The Center provides various resources including a certificate program, a wide range of events, and cutting-edge research. At Northeastern University’s D’Amore-McKim School of Business, the full-time MBA includes a Supply Chain Management concentration for students wishing to drive innovation, establish market differentiation, and boost bottom lines. The curriculum is currently ranked 13th in the nation by Gartner and is designed to give students leadership skills and unprecedented experiential experience. To graduate, students must complete 12 credit hours on topics such as demand planning and forecasting, logistics and transportation management, and sourcing and procurement. There’s also a Supply Chain and Information Management academic group at the school. This group brings together faculty from four interrelated areas to boost research and teaching as well as events and industry partnerships. The York University Schulich School of Business offers the top-ranked MBA in Canada and includes a specialization in Operations Management and Information Systems. This concentration represents three distinct areas of study—information systems, operations management, and supply chain management—for a more well-rounded experience. Students who choose this path must take 12 credit hours on topics such as service operations management, supply chain management, and global operations and information management. The School also offers a Masters Certificate in Supply Chain and Logistics Management as part of its Executive Education programs as well as a Master of Supply Chain Management (MSCM) program. Both options demonstrate the School’s proficiency in the topic. The Carnegie Mellon University Tepper School of Business offers an MBA with a concentration in Operations Management. This concentration allows students to explore operations strategy, service management, supply chain management, and more. Courses within this designation cover such topics as inventory, logistics, operational control, economic value maximization, and more. Tepper is also host to the nation’s capstone MBA Operations Annual International Case Competition each year. This competition brings together 20 of the most elite business schools to compete in operations strategy, supply chain, sustainability, and corporate social responsibility. It’s hosted by such well-known companies as Amazon, Eaton, and Emerson.